Why Use Time Lapse on Your Construction Project? Overseeing the safe, secure, and efficient operation of a construction project or construction site requires implementing a variety of security and surveillance strategies. A construction site is a complicated place: both dangerous and dynamic. Video surveillance and detection remain a cornerstone of construction security, and one modern component of such surveillance is time-lapse video photography. Time lapse video photography allows you to use high-definition images to create a 24-hour, comprehensive overview of your construction site. Here’s why innovative time-lapse photography can be so important. The best part about time lapse photography monitoring is that you can see what’s going on at your construction site 24-hours a day, every day of the week. Using multiple angles in full-color high definition, you’ll be able to view your site and understand what’s going on in through crystal-clear snapshots. Remote management of your project also means reducing on-site visits, meaning you won’t have to hop in a work truck and drive down to the construction site every time you need to have a look at some element of work occurring on your project. Wondering if a delivery has been made? Curious as to what portion of the site is getting the most attention from the crew at a given moment? Do you just want to know if your project is on track? With time-lapse photography, you can take a look without having to be there in person. With time lapse photography monitoring, you’ll be able to view your site from multiple devices using convenient mobile applications. These apps take you beyond simply looking at static high definition images. You’ll be able to zoom in on details, view technical information overlays, and understand the ins-and-outs of your construction project regardless of the time or place. All this is made easy with simple online apps that put you in total control. Time lapse video monitoring is for more than just viewing your site from afar. 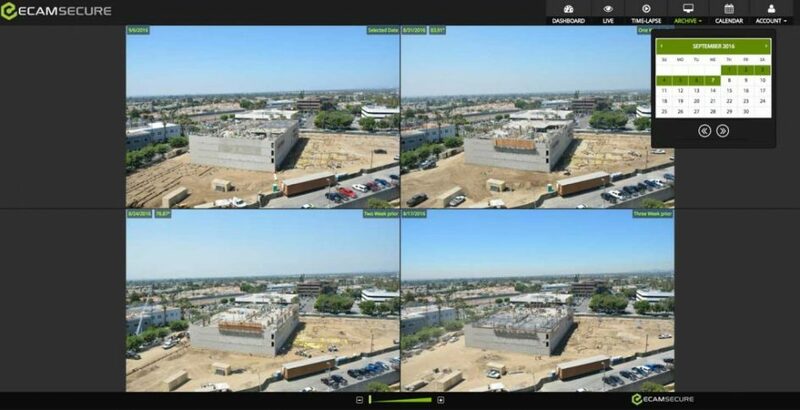 When you utilize time-lapse monitoring for your construction site, you’ll also have access to a deep and detailed visual log of what’s happened at your site. This means that if something should occur—a break-in, vandalism, theft, or accident—you’ll have high definition photographic imagery to understand the situation as it really occurred. This can help you in resolving criminal cases, as well as in reducing liability for accident claims. With crystal-clear photographic evidence, you won’t have to worry about being the victim of criminal activity or insurance fraud. Beyond security and safety applications, time lapse photographic monitoring puts you in a great position to create educational and promotional opportunities for your clients, customers, and community. Whether you want to showcase ongoing improvements to a local area (as we did with San Diego’s “The Plunge”) or you want to demonstrate the efficiency and quality of your work to future prospective clients, time lapse photography makes it possible. You’ll be able to not only show people what’s happening at your construction site right now, but you’ll be able to show clear and consistent progress at the site over any period of time. In all of these contexts, you will be amazed at the high level of quality available from modern time-lapse photography surveillance. Long gone are the days of grainy black-and-white still images. Modern time lapse photography includes high definition images, full color, data overlays, time stamps, and the ability to manipulate images (zoom and pan) all within easy mobile applications.